Two days of celebrating “Film, Fun, and Community!”—see for yourself, and plan to be a part of it next year . . .
All photos ⒸNorth Carolina Museum of History. For permissions, contact the museum photography unit, 919-807-7900. Longleaf 2017 starts winding up as film fans begin taking seats in Daniels Auditorium. And we’re off! The timer counts down to our first film block of the day—and look at the logos of this year’s sponsors . . .
One of this year’s sponsors was the Cary Theater; their sponsorship level earned them a display table, which was manned by Joy Ennis. Thanks, Joy! Yes: concessions, including #FreePopcorn. As always, concessions ruled at Longleaf 2017. You did know we had free popcorn, right? Just one shift of zany, enthusiastic concessionaires . . .
BBQ Proper food truck also helped feed hungry Longleaf attendees on Saturday. A Longleaf Film Festival hallmark: community, between filmmakers and film fans. Here, Teacher of the Year principal Angie Scioli and filmmakers Rob Phillips and Jay Korreck answer audience questions after the film’s screening. Between film blocks, some film fans just cannot resist the concessions, aka popcorn, table! All proceeds support the film festival. Skip Elsheimer (AV Geeks) demonstrates the wonders of—and opportunities with—using repurposed 16-mm films. A hallmark of Longleaf’s host, the Museum of History: learning. Friday’s public workshop featured Skip Elsheimer, of AV Geeks, who rescues films and videos that are regarded as obsolete and useless. Jazz, from Bartending Unlimited in Durham, is one top-notch bartender! She also brightened the Demonstration Gallery during Longleaf’s annual filmmakers’ reception on Friday evening. Step 22 in organizing the filmmakers’ reception: sorting dozens of name tags! Fun at the Friday reception began at check-in, outside the Museum of History’s lobby case, where an exhibit on Jugtown Pottery provided a colorful background. Chatting and networking with others in the industry prevails during the annual reception for filmmakers. Longleaf team member Cassie Bennett talks with a high-school filmmaker who attended the Friday evening reception for filmmakers. Presenters Kim Best and Vernon Rudolph chat at the reception for filmmakers. Could they have been plotting part of their workshop on Saturday? Their session, with Andrew Martin, was a hit! Promotional posters from each Official Selection were displayed throughout the two-day festival. Last out Friday; first in Saturday: most of the Longleaf squad, including (left to right) Cassie, Jerry, Sally, Stephen, Karen, and Chelsea. Saturday began with Estes Tarver, actor and filmmaker, who led his Acting for the Director/Directing for the Actor workshop for a second year. Trivia about each Official Selection film, schedules, maps to the Wrap Party, and more were available at the festival information table. This year’s Saturday lunch-n-learn panel, Getting to Distribution, featured guest speakers Ted Roach (pictured) and Thomas Varnum. Entertainment attorney Thomas Varnum (pictured) joined editor-director-producer Ted Roach to present this year’s noon workshop. Longleaf 2017 presenters (left to right) Ted Roach and Thomas Varnum—Getting to Distribution—and Vernon Rudolph—one of three panelists in So You Want to Make a Movie—mingle between workshop sessions and film blocks. Workshop host Cassie Bennett introduces panelists in the So You Want to Make a Movie workshop (left to right): Vernon Rudolph, Andrew Martin, and Kim Best. In addition to the delights of BBQ Proper food truck, Oak & Dagger Public House served up samples and pints on Saturday afternoon. They also sponsored our first-ever Wrap Party in their Seaboard Station brewery. Following film block D in Daniels Auditorium, filmmakers respond to questions from film fans while preparations are made behind them for the Awards Ceremony. Steve Neilson (Dagtype Films), Longleaf supporter and advisory board member, served as host and emcee for the third annual Awards Ceremony on Saturday evening. This year’s 60 Official Selections included 47 films recognized for Tar Heel Tie-Ins, those having a specific connection to the Tar Heel State. Jill Hammergren accepted Kevin Stocklin’s award for 2017 Narrative Feature/Best Drama, for The Harrow. Katie Damien, Ghost Image, accepted her award for 2017 Narrative Short/Best Horror–Sci-Fi. Four Pies, by Andrew Huggins, won 2017 Narrative Short/Best Drama; his 2016 film, Civil, won in the same category last year. Glenn Pack, no name Maddox, was awarded the 2017 Narrative Short/Best Overall prize. Filmmaker Ricky Kelly accepted the 2017 Documentary Feature/Best History award for Wilmington on Fire, by Christopher Everett. Jim Haverkamp, a Longleaf 2016 award winner, accepts the 2017 Documentary Feature/Best Overall award for The Rise and Fall of Liberty, by Carol Thomson. 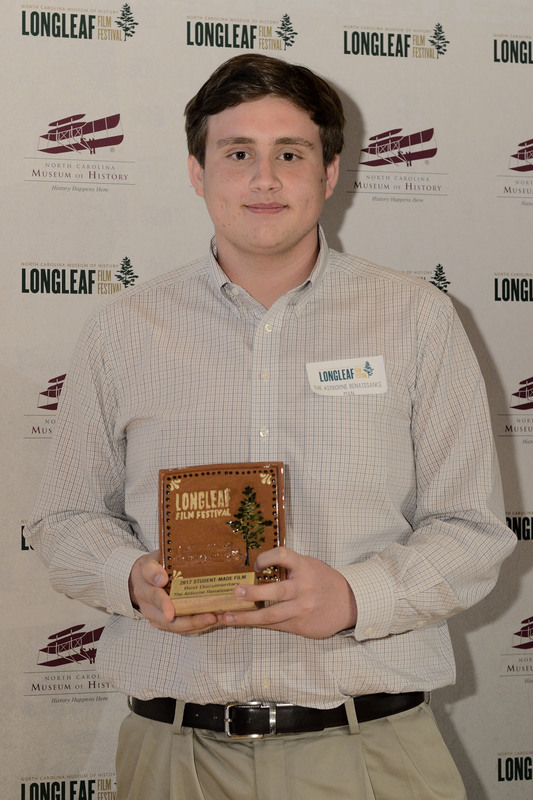 Sam Ramsey had an outstanding night at Longleaf 2017, winning awards for Best Student-Made Documentary and Best Student-Made Film, both for The Airborne Renaissance Man. Still holding one of his own award tiles, Sam Ramsey also accepted the Best Student-Made Narrative film award for his friend, Christopher Matthews, The Boyd Estate. The Longleaf 2017 Made-in-NC Winner was Kelly Creedon, In This World. Longleaf co-organizer closed out Longleaf 2017 with the reminder that, “whatever your passion, it has history.” Her traditional “That’s a wrap, people” then directed festival-goers to the off-site after party. Film, Fun, Community: Thanks, Mike Raab (Relish Our Dogs) for contributing to all three! Planning for 2018 is already in the worksplan to be here. Click here for some facts and figures about Longleaf 2017 . . .
Click here for a list of films screened at Longleaf 2017 . . .
Click here for a list of award winners for 2017 . . .
For permissions, contact the museum photography unit, 919-807-7900.